Results of research in science and technology at the National Bureau of Standards were reported in Scientific Papers. 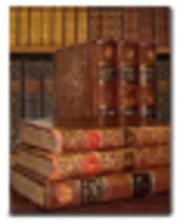 The first 14 volumes of the Scientific Papers were issued as the Bulletin of the Bureau of Standards. These volumes date from 1904 to 1919. The separate papers were called Reprints. Results of investigations of materials and methods of testing were reported in a separate series titled Technologic Papers. In July 1928 the Scientific Papers and Technologic Papers were combined and issued under the title Bureau of Standards Journal of Research. Complete scientific reports of the Bureau's research and development, both experimental and theoretical, in physics, chemistry, and engineering and the results of test and instrumentation activities in these fields were printed in the Journal of Research, (available as a separate collection in this archive). The subject matter of the reports embraced all fields of work conducted at the Bureau. by Dickinson, H.C.; Osborne, N.S. by Osborne, N.S. ; McKelvy, E.C. ; Bearce, H.W. by Rosa, E.B. ; Cohen, L.
by Osborne, Nathan S.; Van Dusen, Milton S.
A full account giving all details. by Bingham, Eugene C.; Jackson, Richard F.
This paper comprises a complete statement of previous formulae and includes the development of a more direct solution of the case where two parallel, coaxial, circular ceils are placed at such a distance that their mutual attraction or repulsion is a maximum. Methods for the application of the formulae, worked-out examples, and tables to facilitate calculation are given. The paper does not permit of a more detailed abstract. by Rosa, E.B. ; Dorsey, N.E. by Curtis, H.L. ; Grover, F.W. A theoretical discussion is given to show the conditions which must be fulfilled in the construction of resistance coils in order that the phase angle shall be small and the change of resistance with frequency negligible. These principles are applied to the design of coils of different values, and specifications are given for the construction of coils of different denominations from 0.1 to 10,000 ohms. by Coblentz, W.W.; Emerson, W.B. ; Long, M.B. by Wolff, F.A. ; Dellinger, J.H. Describes convenient methods for adjusting the Thomson bridge when very low resistances are measured. The adjustments are made without the repeated opening and closing of the low-resistance connection between the two low-resistance arms.